Trichinosis - body, last, Keyword, What Kinds of Worms Cause Trichinosis? Trichinosis (trik-i-NO-sis) is an infection of the muscles by parasitic roundworms found in infected meat. One winter day in 1995, a hunter in Idaho shot a cougar and decided to use it to make jerky, a kind of dried meat. After soaking it in saltwater, he smoked the meat. And he liked the results enough to give his cougar jerky to 14 other people. About 10 days later, the hunter came down with fever, muscle aches, fatigue, and swelling of the face. His doctor suspected trichinosis, an infection caused by eating raw or undercooked meat that contains the larvae * of roundworms. Eventually, health officials confirmed trichinosis in the hunter and in nine others who had eaten his jerky. In fact, they found larvae still living in cougar meat the hunter had frozen. What Kinds of Worms Cause Trichinosis? Trichinosis, which is also known as trichinellosis (trik-i-nel-LO-sis), is caused by five species of roundworms called Trichinella. The most common species is Trichinella spiralis, which is found worldwide in many warm-blooded animals that eat meat. The most common carriers are pigs and wild game, including bears, boar, walrus, and cougar. In the United States, domesticated pigs rarely become infected, thanks to laws against feeding uncooked garbage to pigs. As a result, only 13 cases of trichinosis were reported in the United States in 1997. * larvae are worms at an intermediate stage of the life cycle between egg and adult. Once Trichinella larvae get into muscle, they enclose themselves in protective capsules called cysts. When a person or animal eats meat containing these cysts, acid and enzymes in the stomach release the larvae from their capsules. 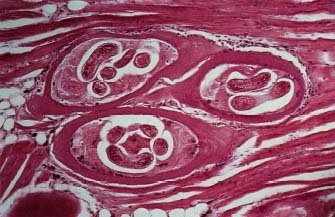 Cysts in muscle tissue containing Trichinella larvae. © EdReschke, Peter Arnold, Inc. The larvae invade the mucous lining of the intestine. After about two days they mature into adult worms and mate. Females are about 3.5 mm long (less than 2/10 of an inch), and males are about 1.5 mm long. After about a week, the female worms release larvae that enter the bloodstream and lymphatic system, which distribute them to the muscles. There they form cysts, which takes four to five weeks. Larvae in cysts remain viable * for months to years. The incubation * period may be from two to seven days. At first, there may be no symptoms or only mild ones, with fever, diarrhea, abdominal pain, and vomiting. The initial stage lasts from one to six weeks. It overlaps with the second stage, the muscle invasion stage, which begins at the end of the first week and continues for about six weeks. Symptoms include fever, muscle aches, swelling of the face, especially around the eyes, conjunctivitis (inflammation of eye membranes), and rash. If the larvae infect the heart, lungs, or central nervous system, this can be life-threatening. In the third stage, the larvae form cysts. Symptoms are muscle aches and weakness, which may last for several months before fading away. How Is Trichinosis Diagnosed and Treated? During the first stage, the symptoms are common ones and no diagnostic test is available. During the second and third stages, a biopsy (tissue sample) of the muscle may show larvae or cysts. Within two weeks of infection, blood tests generally become positive. These tests look for antibodies, which are substances the immune system produces to fight the worm. * incubation (in-ku-BAY-shun) means the period of time between infection and first symptoms. The doctor may prescribe anti-parasite and anti-inflammatory medications to help get rid of the worms in the intestine and to ease the symptoms caused by the cysts. Smoking, pickling, and preserving meats are not enough to prevent trichinosis. The only way to prevent trichinosis is to make sure that all meat is completely cooked before it is eaten. Meat must be cooked until it is gray inside, not pink, which means heating it to a temperature of at least 150 degrees Fahrenheit (150°F). Freezing meat at 16 degrees Fahrenheit (16°F) for two or three days may also be effective, but researchers believe that much lower temperatures may be required for meat from Arctic animals. The U.S. National Institute of Allergy and Infectious Diseases (NIAID) has a fact sheet about trichinosis and other roundworm infections at its website.